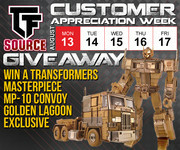 New Transformers Archive - TFSource Customer Appreciation Week is back! Daily Sales & Giveaways! TFSource Customer Appreciation Week is back! Daily Sales & Giveaways! One of our favorite ways to show our customers some love is back! Customer Appreciation Week starts today! We have a fun week of events planned, so be sure to stay tuned each day for daily sales and giveaways! We’re kicking off Day 1 with MPM-5 Barricade for only $69.99 and MP-08X King Grimlock for $129.99 PLUS we are giving away a MP-10 Convoy Golden Lagoon! Check our Facebook and Instagram pages for how to enter the MP-10 Convoy Golden Lagoon Giveaway!